(a) Remove the transfer gasket from the transfer assembly. (a) Using a screwdriver and a hammer, remove the transfer case breather plug from the No. 1 transfer case cover. NOTICE: Be careful not to damage the contact surface of No. 1 case cover. (a) Remove the 8 bolts. (b) Using a brass bar and a hammer, remove the No. 1 transfer case cover from the transfer case. NOTICE: Be careful not to damage the contact surfaces of the case and cover. (a) Remove the bolt and breather oil deflector from the No. 1 transfer case cover. 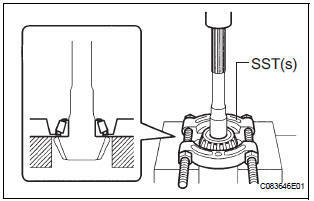 (a) Remove the 3 bolts and the transfer dynamic damper from the transfer extension housing subassembly. (a) Remove the 4 transfer case straight pins from the transfer case. (a) Remove the 4 transfer and transaxle setting stud bolts. (a) Fix the transfer assembly to the overhaul attachment. (a) Using a plastic hammer, remove the transfer extension housing dust deflector from the transfer extension housing sub-assembly. NOTICE: Be careful not to damage the oil-seal-fitted surface of the housing and the inside surface of the bush. (b) Using a plastic hammer, remove the transfer extension housing sub- assembly from the transfer case. 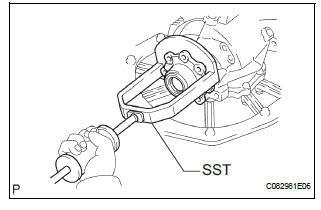 (a) Using SST(s) and a torque wrench, check the initial torque with the backlash range. 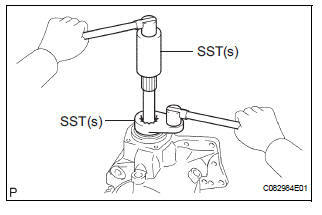 (b) Using SST(s) and a torque wrench, check the initial torque while the driven pinion is in contact with the ring gear face. (a) Using snap ring pliers, remove the shaft snap ring. 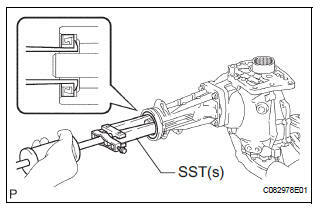 (b) Using SST(s), remove the CTR differential lock sleeve. (a) Using a screwdriver with the tip protected by vinyl tape, remove the O-ring from the CTR differential lock sleeve. NOTICE: Be careful not to damage the lock sleeve's groove for the O-ring. 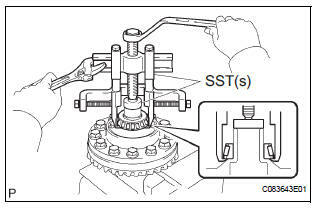 (a) Using SST(s), remove the transfer case oil seal from the case. NOTICE: Be careful not to damage the oil-seal-fitted surface of the case. 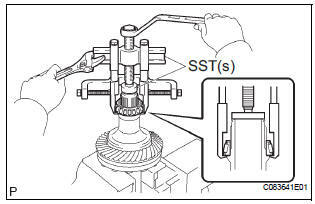 (a) Using SST(s), remove the transfer RH bearing retainer oil seal from the transfer RH bearing retainer sub-assembly. NOTICE: Be careful not to damage the oil-seal-fitted surface of the retainer. (a) Remove the 7 bolts from the transfer RH bearing retainer sub-assembly. 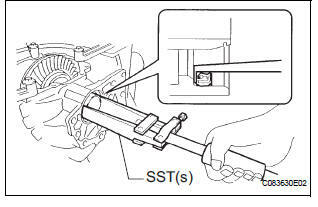 (b) Using SST, make a clearance between the transfer RH bearing retainer sub-assembly and the transfer case. 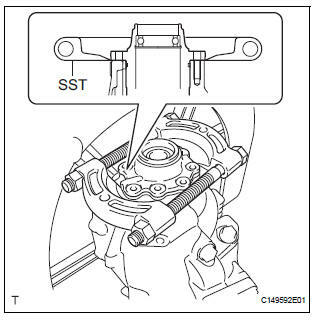 SST 09950-00020 (c) Remove the SST. 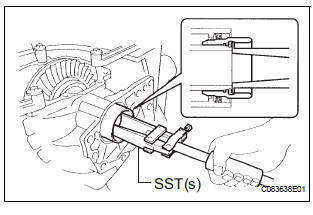 (d) Using SST, remove the transfer RH bearing retainer sub-assembly from the transfer case. 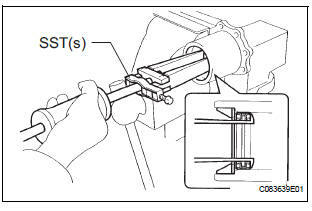 (a) Using a screwdriver with the tip protected by vinyl tape, remove the 2 O-rings from the transfer RH bearing retainer sub-assembly. NOTICE: Be careful not to damage the retainer's grooves for the O-rings. (a) Fix the transfer RH bearing retainer sub-assembly in a vise. (b) Using SST(s), remove the center differential case tapered roller bearing RH outer race, transfer ring gear mounting case washer No. 2 and right bearing retainer oil seal No. 2 from the transfer RH bearing retainer sub-assembly. NOTICE: Be careful not to damage the oil-seal-fitted surface of the transfer RH bearing retainer subassembly. (a) Using snap ring pliers, remove the side gear shaft holder hole snap ring. (b) Remove the side gear shaft holder bearing from the transfer RH bearing retainer sub-assembly. (a) Remove the transfer ring gear mounting case from the transfer case. 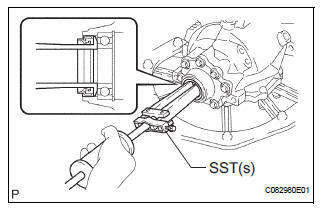 (a) Using SST(s), remove the inner race of the center differential case tapered roller bearing from the transfer ring gear mounting case. 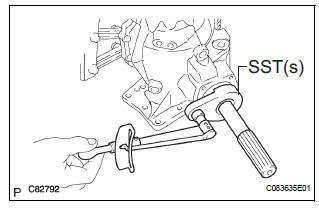 NOTICE: Apply grease to the screw thread and tip of the SST(s) before use. (b) When the roller comes off due to deformation of the gauge, completely remove the roller and remaining inner races of the center differential case tapered roller bearing from the transfer ring gear mounting case. (c) Using SST(s), remove the inner race of the center differential case tapered roller bearing from the transfer ring gear mounting case. (d) When the roller comes off due to deformation of the gauge, completely remove the roller and remaining inner races of the center differential case tapered roller bearing from the transfer ring gear mounting case. 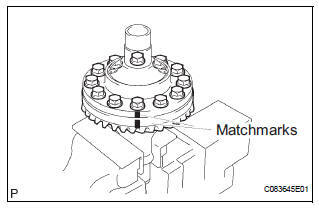 (a) Put matchmarks on the transfer ring gear mounting case and the ring gear. (b) Remove the 12 bolts. 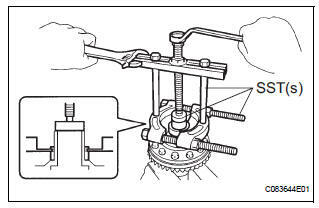 (c) Using a plastic hammer, remove the ring gear by tapping around its periphery. NOTICE: Do not damage the teeth of the ring gear. 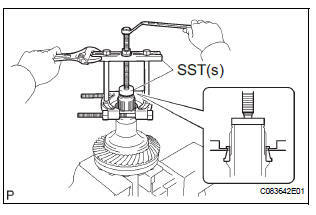 (a) Using SST(s) and a hammer, unstake the transfer gear nut. 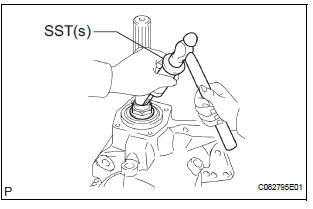 (b) Using SST(s), remove the transfer gear nut. (c) Using a press, remove the driven pinion, transfer driven pinion rear bearing inner race and transfer pinion bearing spacer. Put shop cloths around to help prevent the driven pinion from bearing dropped. (a) Using SST(s) and a press, remove the transfer driven pinion front bearing inner race from the driven pinion. (a) Using a brass bar and a hammer, lightly strike the center differential case tapered roller bearing LH outer race at 2 positions to remove it from the transfer case. (a) Remove the ring gear mounting case plate washer from the transfer case. (a) Using brass bar and a hammer, lightly strike the transfer driven pinion front bearing outer race at 2 points to remove it from the transfer case. (a) Remove the transfer output washer from the transfer case. (a) Using a brass bar and a hammer, lightly strike the transfer driven pinion rear bearing outer race at 2 points to remove it from the transfer case.